Join us for our third annual Art + Feminism Wikipedia Edit-a-Thon! Learn Wikipedia editing basics and expand and improve pages for cis and transgender women, non-binary folks, feminism and the arts on Wikipedia, with a special focus on artists represented in the Gallery's collections. Co-sponsored by the University of Maryland Art Gallery and the Michelle Smith Collaboratory for Visual Culture. Celebrate Black History Month with MICA (Multicultural Involvement & Community Advocacy). Light refreshments at the opening night of a month-long curation of inter-generational art in the Herman Maril Teaching and Research space to celebrate black artistry and movement. All are cordially invited to the opening reception for Here and Now: Recent Acquisitions. This exhibtion honors the many generous contributions from donors that make possible the continued growth of the University of Maryland Art Gallery's permanent collection. Several masterpieces will be on display, including paintings by Paul Reed, prints by Salvador Dalí and Emil Nolde, video works by John Baldessari, numerous examples of African Art and Latinx Art, among many others. Join us we partner with STABLE Arts DC for a spirited conversation with DC-based artist Robin Bell and LA-based author, critic, and historian Norman M. Klein, as they discuss the act of projecting politics and artful activism in the age of Trump, from the artist's perspective. The conversation will be moderated by University of Maryland Art Gallery associate director Taras W. Matla. Join authors Norman M. Klein and Margo Bistis for an in-gallery conversation exploring their book The Imaginary 20th Century and the exhibition that is built around it -- of the same name -- in the Gallery Shop. Following the talk, all attendees are invited to reflect on the exhibition at our Coffee Happy Hour in the Parren J. Mitchell Art-Sociology Bldg. Atrium. Coffee and pastries will be provided by craft coffee brewers Lost Sock Roasters. This talk is supported in part by a grant from the Maryland State Arts Council. Cuban-born, Brooklyn-based artist Carlos Martiel will be in conversation with University of Maryland Art Gallery associate director Taras W. Matla and Dept of Art History and Archaeology graduate student Patricia Ortega-Miranda. They will discuss the intersection of geopolitics, cross-cultural borders, and identity in Martiel's art. This event is in association with the Art Gallery's Visiting Artist Lecture/Project and UMD's Year of Immigration initiative. Join Department of Art faculty members Leslie Berns, Cy Keener, and W.C. Richardson for an in-gallery conversation exploring their contributions to the Glances From Infinity exhibition. 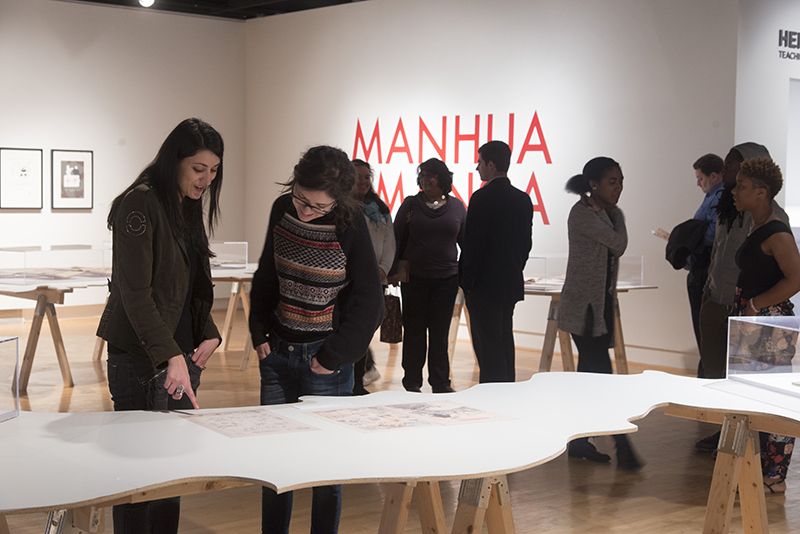 Following the talk, all attendees are invited to reflect on the exhibition at our Coffee Happy Hour in the Parren J. Mitchell Art-Sociology Bldg. Atrium. Coffee and pastries will be provided by craft coffee brewers Lost Sock Roasters. This talk is supported in part by a grant from the Maryland State Arts Council.